UC San Diego’s synthetic biology student org earned the title of best team in North America at this year’s iGEM competition. Not many people can say that they’re the second-best in the world at something. The members of UC San Diego’s SynBio team, however, can do just that. This organization was founded only four years ago, yet it managed to climb to the near-top of the world standings at the annual International Genetically Engineered Machine competition in Boston, an international, research-based competition which centers on using synthetic biology to solve relevant medical and biological global issues. UCSD’s team took second place for its overall project and won a multitude of other sub-category prizes, beating out powerhouse favorites Imperial College London and Heidelberg University in Germany, as well as 300 other teams who competed at iGEM. The UCSD team’s achievement is nothing short of remarkable. SynBio is an on-campus organization dedicated to teaching students the importance of synthetic biology. It aims to bridge the gap between the acclaimed engineering and biology programs at UCSD and encourages collaboration between the two. Earl Warren College junior and bioengineering major Varun Govil joined the organization during Winter Quarter of his freshman year in the hopes of shepherding a vision for the group. He came up with the ideas for both this year’s project and last year’s competition. He reads countless amounts of academic literature, hoping to get inspired and find an area that his team can supplement with its research. Govil recruited members for his team by conducting multiple interviews and dividing the chosen students into the three main categories that the project would cover: the dry lab (coding and other computer data work), the wet lab (the work in the lab with cells, DNA, and proteins), and the public-engagement component. He found seven members for his technical team. 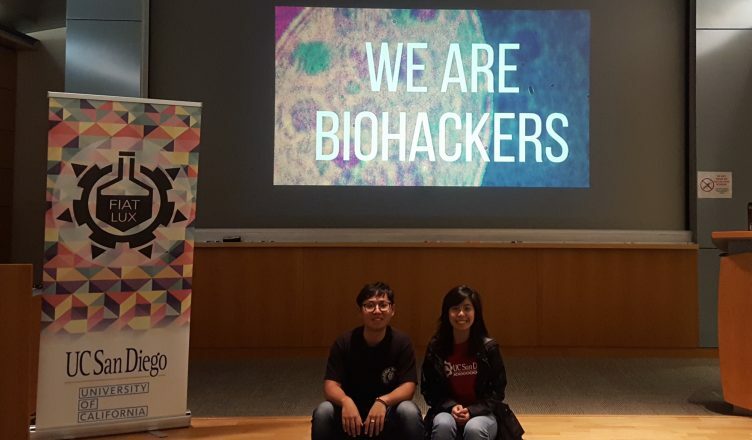 SynBio’s project this year was to establish a noninvasive diagnostic technology that could detect cancer. Tissue biopsy, the common method of diagnosing cancer, or “the method we were all taught in grade school” (as Govil puts it), involves extracting DNA from the patient and comparing it to a healthy DNA pattern to determine whether or not the patient has cancer. However, this procedure is not only invasive for the patient, but it can also be relatively inaccurate. SynBio’s research and planned alternative procedure involve liquid biopsy, or a simple drawing of blood, which is a far less intrusive method of evaluating DNA patterns. The team decided to look at alterations in the patient’s genetic code once the blood had been drawn. The members of the team analyzed endless patient samples that were provided to them by the lab they partnered with, and used machine learning (artificial intelligence) to find patterns in the DNA, which vary depending on the type of cancer. The proteins the team engineered bound to regions on patients’ DNA that were hyper-methylated and gave off a fluorescent signal. All of this work was done over the summer at UCSD’s School of Medicine. The complex process meant that Govil worked 80 hours a week all throughout the summer. Last year, Govil acted as team leader, and though the team’s project was much-talked about and supported by all of the bioengineering department, a devastating mistake in failing to provide sufficient validation for the DNA sample used cost the team any chance of placing at iGEM. Feeling defeated, Govil was ready to resign upon returning to San Diego from Boston. The SynBio team saw a complete turnaround over the course of a year. It kept its expectations in check this time, simply hoping its results this year would be a building block for next year’s team. Govil and his team kept an eye on their emails after they had competed for the past three days, constantly checking for any notification from judges. None came, which made it all the more of a surprise when the team saw “UC San Diego” listed as a finalist. Govil has far too many favorite memories to count over the course of the experience. It’s clear this endeavor has been a passion project since day one, and the amount of pride he has in his team members and their accomplishments is reflected in his speedy recollections of their moments of victory. The team’s transformation over the past year is what he’s most proud of. He gives a special shoutout to his team, who were grilled with 15 complex questions from a seasoned professional judge during the competition. They answered them all. This moment was Abbas’s favorite in the entire competition. While Govil won’t be leading the team next year, he’ll be back as a mentor. He wants to build on its current success and restructure the team. Most of all, he wants to see SynBio’s popularity and presence grow. The organization has even written a textbook to make synthetic biology more accessible for students in grade school. Both Govil and Abbas believe that being a part of SynBio has affected their goals for the future. Govil originally thought he would go into the biotechnology industry and spend his days at a lab bench. Now, he’s realized he wants to be more involved in the big picture by pulling the strings. Perhaps most importantly of all, SynBio at UCSD has contributed to a field that needs as much help as it can get, given the current political climate. The Trump administration has announced its plan to redirect finances used for cancer research into immigration detention. This includes taking away millions of dollars from the National Cancer Institute. Govil points out that scientists get stuck in their “little vacuums” all too often, and it’s important to think politically and economically when conducting research. Abbas also thinks that the lack of reliable and affordable healthcare in the United States should be a matter of utmost concern for scientists and researchers everywhere. Though Govil believes President Donald Trump and his cabinet are sabotaging the future of many citizens by perpetrating scientific falsehoods, instead of focusing energy on innovation, he’s hopeful that scientists can and will continue to adapt and make advancements for those in need. Govil can see this happening at UCSD. Picture courtesy of UCSD Synbio.